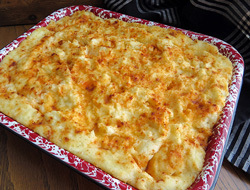 You will appreciate being able to make these potatoes ahead of time so all you have to do is pop them in the oven an hour before you are ready to eat. But the best part will be their surprisingly great taste. 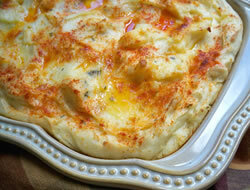 With or without gravy, you are sure to love these tasty mashed potatoes. 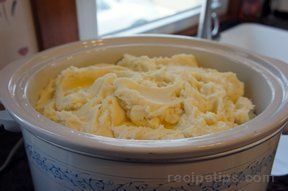 Place peeled and quartered potatoes in large kettle, cover with water and boil. Reduce heat, cover and cook for 20-25 minutes or until potatoes are tender. Drain and mash in large bowl. Add sour cream, cream cheese, and 4 tbsp. 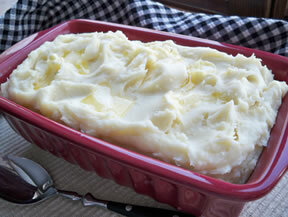 margarine; beat until cream cheese and margarine are melted and potatoes are smooth and fluffy. Spread in greased 9x13 baking dish. Melt remaining 2 tbsp. of margarine and drizzle over potatoes. Sprinkle with paprika. Refrigerate or bake immediately. Preheat the oven to 350°. Bake for 40 minutes covered. Uncover and bake an additional 20 minutes. If refrigerated, let stand at room temperature 30 minutes before baking. "These potatoes were excellent! I loved the fact that I could make them ahead of time and they tasted great. They are perfect with or without gravy."